Before Moving To Big Data | Fulcrum ConsultingWorks Inc. In today’s podcast Rebecca explains why big data is unlikely to help a company that isn’t already effectively using the small data that they have. 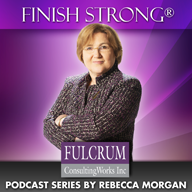 This entry was posted in Podcast Series: Finish Strong® and tagged big data by Becky. Bookmark the permalink.